Beautiful lace paper Doiliy. 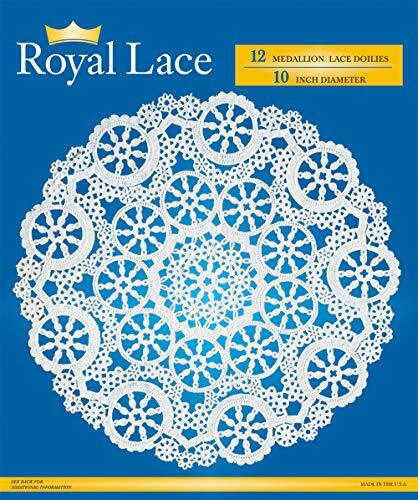 Royal Lace medallion lace paper doilies are round white doilies for tabletop decorations and arts and crafts projects. These doilies have an antique medallion lace design engraved on paper. The design is a reproduction of a French lace. White lace paper doilies can be used for festive occasions like Christmas parties, Valentine's parties, weddings, anniversaries and any celebration that needs an extra touch of elegance. These delicate lace doilies are great for wrapping small gifts, for card making, and craft projects and scrapbook projects. Paper doilies are also great with paper boxed for cakes or take-out. Use as: cake laces, coasters, beverage under liners, place on trays, place in baskets, under juice glasses, under sugar bowls, under butter, under after-dinner mints and under flower vases and more. Display your creation on a platform worthy of it. 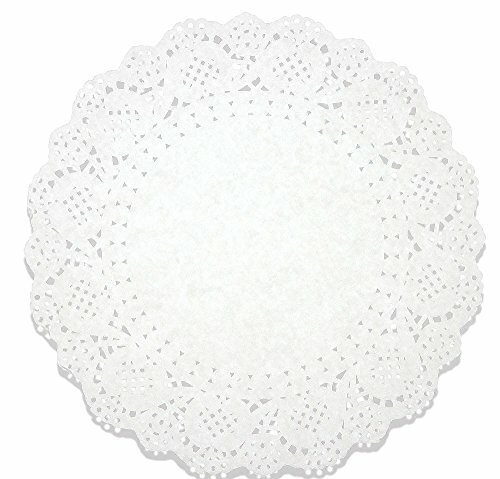 Minas Store paper lace doilies are perfect for serving your creation with honour; add a professional look to your table. Our round shape paper lace doilies are sturdy and provide a solid support to your appetizers, dessert and much more… Look fantastic placed under cakes, tea cakes, or other dessert items also can serve as cake mats, can place them under trays, glasses, butter, flower vases and so on.Use paper doilies to make beautiful arts and crafts such as scrapbooking and making doily cards. . Pack contains 120 round shape paper doilies of 4, 5, 6, 8, 10 and 12 inches (20 of each) assorted sizes perfect for exactly what you need! 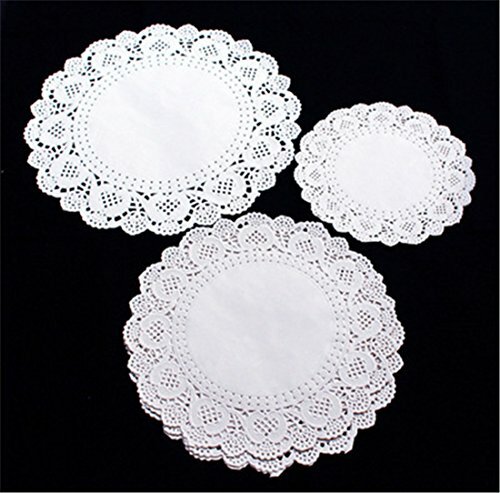 Our paper lace doilies are safe and hygienic to use with food items. These paper laces doilies are disposable. 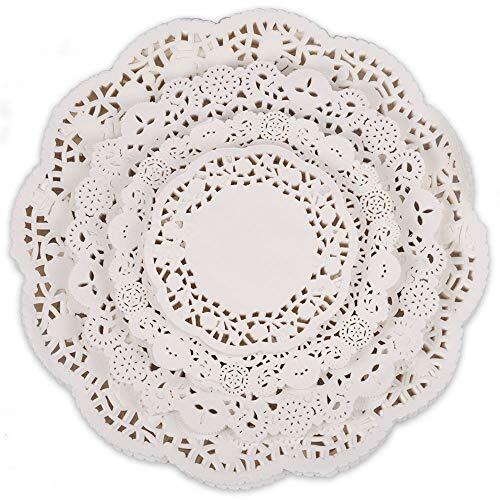 Throw away these disposable doilies once used without the worry of washing or storing.Minas Store proud to offer quality products at an affordable price to help you arrange a perfect party. Customer satisfaction is our top priority. If u have any issues related to our product feel free to contact us we are always here for you! Minas Store paper lace doilies are perfect for serving your creation with honor and adding a professional look to your table. 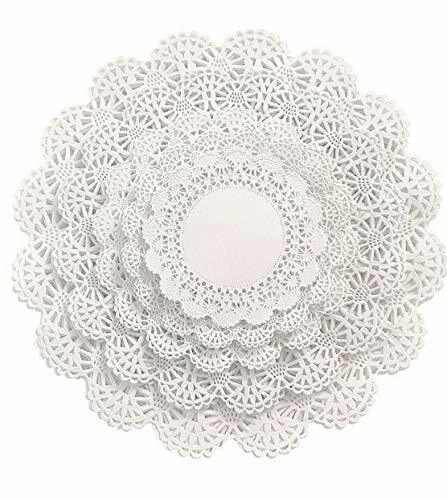 Our round shape paper lace doilies are sturdy and provide a solid support to your appetizers, dessert and much more; look fantastic placed under cupcakes, tea cakes, or other dessert items. 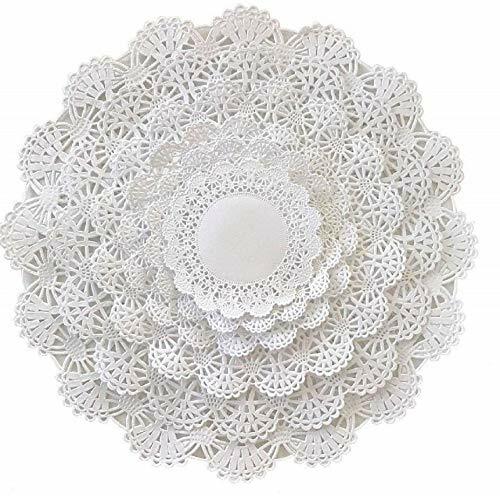 Also can serve as cake mats, can place them under trays, glasses, butter, flower vases and so on.Use paper doilies to make beautiful arts and crafts such as scrap-booking and making doily cards. Classical for giving your baking a proficient look. Pack contains 150 round shape paper doilies with a size of 4,5,6,8 and 10 inches (30 of each size). Perfect for exactly what you need!Our paper lace doilies are made from sturdy paper materials for safe and hygienic use with food items. These paper laces doilies are disposable. Throw them away once used without the worry of washing or storing. Minas Store proud to offer quality products at an affordable price to help you arrange a perfect party. Customer satisfaction is our top priority. If u have any issues related to our product feel free to contact us we are always here for you! 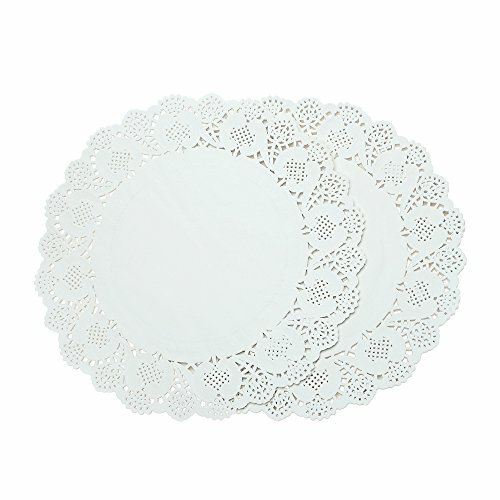 HAKSEN 36 PCS Paper Lace Doilies Combo,Pack 12 each 6.5", 8.5" , 10.5"
About HAKSEN 36 PCS White Round Paper Lace Doilies Combo,Pack 12 each 6.5", 8.5" , 10.5Features:Safe and non-toxicMultipurpose:Use paper doilies to make beautiful arts and crafts such as scrapbooking, ornament making, gift wrapping, and making doily cards.Perfect birthday cake doilies, wedding cake doilies or any occasion cake doily.Specification:Material: Regency Doilies are made of paper lace.Size: 6.5 inches, 8.5 inches, and 10.5 inches in diameter respectively.Paper Lace Doilies Combo, Pack 12 each 6.5", 8.5" , 10.5"Brand: HAKSEN Our brand purpose: CUSTOMER FIRST 30-Day Money Back Guarentee.100% Secure Shopping Please select HAKSEN seller--Thank you! Need a fancy touch to your home decor or occasion? 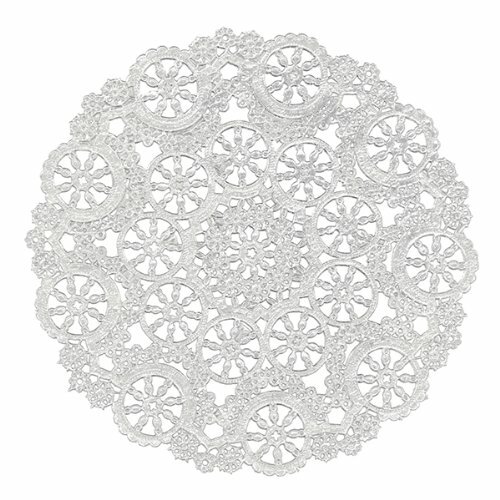 These Paper Doilies by Juvale make the perfect addition to any home decor or special event. Intricate design makes this a great addition for any occasion or holiday! These make a great crafting project, holiday decor, tabletop decor, and so much more! Doilies measure 10.5 Inches in diameter. 100% brand new and good quality. Comes with 250 doilies. Thanks for watching & remember to Comment, Rate & Subscribe. In this video, Diane Peternel shows some of the lace effects that can be easily created using paper doilies.